﻿ How Much Do You Know about CWDM SFP Transceiver? How Much Do You Know about CWDM SFP Transceiver? CWDM SFP (Coarse Wavelength Division Multiplexing) transceiver, used on SFP ports or slots on the switches or routers, is a technology that allows for multiple channels, of mixed protocols and data rates, to be COMBINED and transmitted over fiber optic cable. CWDM SFP makes use of the SFP interface to connect the apparatus and also double LC/PC fiber connector software to connect the optical network. CWDM SFP is used to link the ports to the fiber optic network, typical CWDM SFP like Cisco’s could support both Gigabit Ethernet and Fiber Channel. It is compatible with Fast Ethernet, SONET OC-3 and OC-12, and SDH STM-1 and STM-4 standards. The CWDM SFP transceiver consists of three sections: a uncooled CWDM DFB laser transmitter, a PIN photodiode integrated with a trans-impedance preamplifier (TIA) and MCU control unit. The transceiver integrates the receiver and transmitter path on one module. On the transmit side, the serial data stream is passed to a laser driver. The laser driver biases and modulates an uncooled direct modulated laser (DML), enabling data transmission over single-mode fiber through an industry-standard LC connector. On the receive side, the optical data stream is recovered from a PIN or avalanche photodetector (APD), sent to a transimpedance amplifier, and then passed to a post amplifier. This module features a hot-pluggable SFI-compliant electrical interface. 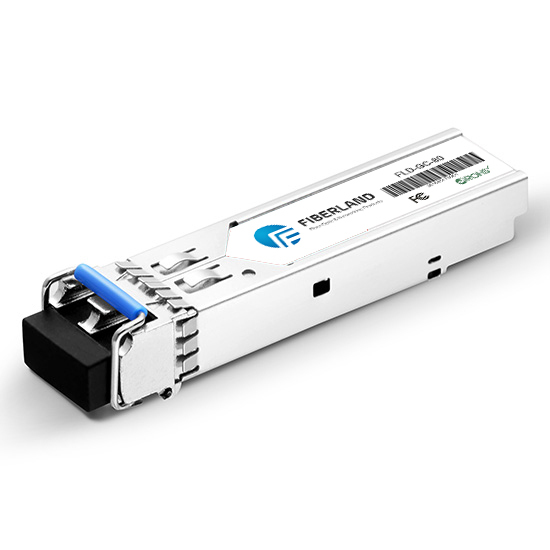 This integrated fiber optic transceiver provides a high-speed serial link at signaling rates from 100 Mbps to 3.1Gbps. The module complies with the small form factor pluggable (SFP) multisource agreement (MSA). Typical CWDM SFP transceiver includes CWDM SFP 1470nm, CWDM SFP 1490nm, CWDM SFP 1510, CWDM SFP 1530nm, CWDM SFP 1550nm, CWDM SFP 1570nm, CWDM SFP 1590nm and CWDM SFP 1610nm. Cisco CWDM SFP is a series of single mode transceiver cover from 1470 to 1610nm wavelength applications, they are different colors to identify them; these CWDM SFP are used for Gigabit Ethernet and 1/2Gbps Fibre Channel applications. Juniper CWDM SFP transceiver module includes SFP-1GE-LH-CWDM-1270, SFP-1GE-LH-CWDM-1290, SFP-1GE-LH-CWDM-1310, SFP-1GE-LH-CWDM-1330 and SFP-1GE-LH-CWDM-1350. The Juniper CWDM SFP transceivers are with excellent quality. Foundry CWDM SFP transceiver works at 80KM and with different working wavelength from 1470nm to 1610nm. It is fully compatible and functional in its intended Foundry router or switch and complete MSA compliant.